Many people use their mobile phones for playing music. Unfortunately, most phone speakers aren't loud and don't reproduce bass well. With that in mind, Bluetooth speakers are a godsend. They come in all shapes and sizes and allow you to be mobile without having to sacrifice too much in volume and quality. Despite the fact that music can be streamed on demand from phones, there are people who still enjoy listening to FM radio broadcasts. The good thing is that some Bluetooth speakers have a built-in FM radio function. The Monster Nomad is quite a beast of a speaker. It's a slightly bulky bit of hardware but it is so well-built that you can easily forgive its shortcomings. The Nomad is an overall great sounding speaker which you can get plenty of indoor and outdoor use from. It has a formidable battery life, great build quality and a number of features. If you want speakers to use in a bedroom or study room, it's a better option to go with bookshelf speakers. As soon as you look at the Monster Nomad you can tell that this speaker is built for heavy duty use. Its robust design makes it suitable for camping trips or small outdoor activities. It has an aesthetic design which is partly inspired by the boom-box look. The material is nice and sturdy and doesn't rattle while playing music, even at high volumes. All-in-all, the build quality of the Nomad is pristine and solid. The overall sound quality on the Nomad is really good. It has a great bass response without being too boomy and muddy sounding. The high end is nice and clear too which makes the speaker well-balanced overall. The overall volume of the device is loud which makes it suitable for outdoor use. Even at near full volume, it doesn't distort. It must be noted that the bass response is best when indoors. The speaker has to be well positioned when being used outdoors for optimum sound quality. This shouldn't come as a surprise though seeing as Monster was the original manufacturer of one of the most popular headphone brands in recent years Beats by Dre. To top it all, this Bluetooth speaker has a separate input for connecting a microphone/guitar using the included adaptor. So you can start a jam session while on the go. The FM radio quality is good overall, but just like any other FM tuner the quality of the signal mostly depends on where you are physically located. If coverage is good in your area then you shouldn't have any issues. Another neat feature is that the speaker shows you the frequency of the station you're tuned into, so you don't have to play the guessing game as is the case with many speakers of this kind. The best thing about this speaker is its phenomenal battery life. It can last up to a whopping 30 hours on a single charge. The Nomad also has a USB port which can be used to charge other mobile devices. So you get two- three devices in one; a speaker, an FM radio tuner and a power bank. There's a reason why the Sbode M400 Bluetooth speaker is an Amazon bestseller; it's a great piece of hardware that delivers good quality sound, is durable and light-weight. 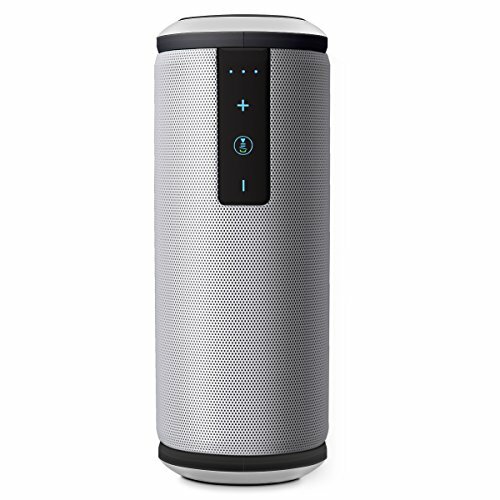 The speaker is about the size of an oversized drink can which makes it quite easy to hold. Its housing is rubberized for extra durability. A bass radiator sits on either side of the device to add a little more low-end to it. The control buttons are covered in rubber casing which can be closed when you need to use the speaker in tough weather conditions. After all, the M400 is marketed as an outdoor speaker, and rightfully so as it's dust and water resistant. If you want to use the speaker in the shower you can do so. Just make sure the rubber casing over the control buttons is secured. Note that although this speaker is water-resistant you should not submerge it in water as it may cause damage. Sound quality is by far the most important factor when dealing with speakers and the M400 does a good job in delivering a balanced, clear sound. The dual drivers and bass radiators enable the sound to stay crystal clear regardless of the genre of music you decide to play through the speakers. There's also no fear of distortion on this speaker, even at high volumes. Lows, mids and highs are all played back cleanly. It could use a bit more oomph in the volume department. It's meant to be used at close range, so it's not suited for outdoor use in a wide open space. As long as you use it in a moderately confined space you should be okay. The "true wireless stereo" feature of the speaker enables you to sync two M400 speakers together so as to mimic a stereo system. One speaker plays the role of the left channel while the other plays the role of the right channel. The FM radio functionality works as expected. There's nothing particularly extraordinary about it. Signal reception is as good as other radios or speakers of this kind. One caveat is that there's no LCD display for displaying the stations. So when searching for stations you're doing so blindly. If you have a specific station that you listen to, then you're better off just finding it, setting it once and not tampering with the radio portion again. The M400's battery has a capacity of 22,000mAh. This equates to approximately 6 to 8 hours of usage, which is ok. Recharging the battery takes an hour and a half. It's important to take note that this speaker's battery performance is affected by temperature. So using it in very cold conditions may reduce the overall battery life. The Elegiant portable Bluetooth speaker is a feature-rich device with a unique display and overall good sound quality. The Elegiant speaker is really well put together. It has an elegant, classy aesthetic design. The display on this speaker is very stylish and one of the best of its kind. The time, temperature and battery level are all visible right through the speaker fabric. The speaker is well-built and doesn’t feel flimsy in the hand. It’s a carefully crafted piece of hardware that feels good to carry and is pleasing to look at. The sound quality is quite good and the volume is pretty loud on this unit. One great thing about this unit is that there’s a speaker cone on either side of it. So it offers a sort of quasi 360 degrees sound space. The mids and highs are reproduced quite well. However, the bass can get a little muddy and unclear if the speaker is turned up too loud. However, this also depends on the type of music you’re listening to. All-in-all, the sound on this unit is quite good. 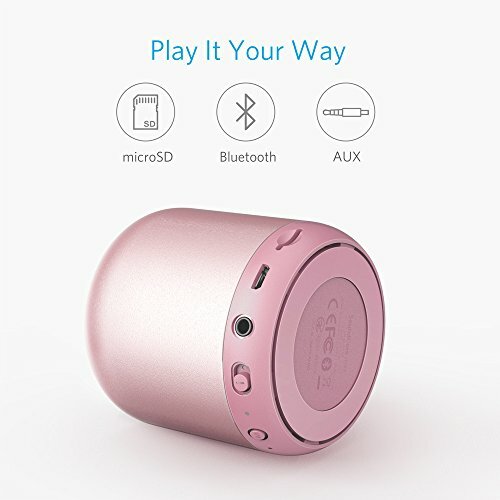 You can play music on this device using four different methods; Bluetooth, FM radio, plugging in a sound source using the 3.5mm jack or by inserting a TF card. The radio quality on this unit is as clear as can be. The antenna reception is as good as other speakers in the same range as this device. The Elegiant Bluetooth speaker's battery life is really good. It can play music at full volume for up to 10 hours on a single charge. The battery has a capacity of 2200mAh. Although the 10 hour playback time is quite good there’s the caveat that charging the speaker fully takes roughly 4 hours which is a pretty long time. The speaker performs better if it’s being used for handling calls though. It can last up to 15 hours on a single charge in that scenario. The Pyle PBMSPG50 Street Vibe is a boom-box style Bluetooth speaker with a sizeable number of functionalities. The Pyle Bluetooth speaker weighs 5.31 pounds, which is a decent weight considering its other physical dimensions. It has a really clean, stylish look which is slightly reminiscent of boom-boxes from the 90s albeit with an LCD. It has soft touch buttons on the top for controlling the music playback, tuning radio stations, etc. The ported tube design, although functional, gives it a very stylish vibe. The speaker is well put together; no creaks, squeaks or funny business here. This speaker is quite big, which is an advantage because it allows it to have a nice amount of bass. However, the bass is not excessive. It is just a portable speaker after all. So don’t except bone-rattling bass. How you perceive the mid and high-end performance is mostly dependent on the type of music you’re playing as well as the EQ setting. The speaker has some built-in EQ presets which allow you to modify the listening experience. When playing back sound using the SD card, an MP3 player or other Bluetooth devices the sound is really good. However, when using the built-in FM radio it’s a bit hit or miss as far as sound is concerned. Radio quality is good when you’re tuning in to stations which have ample transmission power. However, when tuning in to smaller, less-powerful stations there’s a noticeable amount of interference which can be rather annoying. If you’re using the FM radio function you should try to keep the speaker away from other electronic devices as they may cause interference. The Pyle has a built-in 2200mAh battery which lasts roughly 4.5 hours on a single charge. It’s nothing spectacular when you compare it to other boom-box style speakers such as the Monster Nomad. The battery life is not ideal for long getaways where you don’t have a power bank or access to electricity, such as a weekend-long camping trip. The Tivoli Audio M1BTCLA is a unique-looking, tasteful Bluetooth speaker. It has physical knobs for tuning, volume and choosing the input method. Right off the bat the uniqueness of the speaker’s design is visible. It doesn’t take the usual route of using plastic or metal housing. It uses wood instead which gives it a retro look. It has a throw-back knob for tuning the radio and two other knobs, one for selecting the playback mode and the other for controlling volume. Its dimensions are 5.2” x 8.4” x 4.5”. It’s a light-weight speaker making it easy to move from room to room. The speaker comes in different colour combinations including black ash/silver, black ash/black silver, walnut/beige, cherry/silver or white/silver. The quality of the sound on this speaker is really pristine. The sound is rich as is to be expected from wood speakers. It has some warmth to it. The bass response is deep, but not exaggerated. The [usually] problematic mids are well-balanced and lack the mud that often plagues this region. There’s no option to adjust the bass or treble on this device, so any adjustments you make have to be done on the Bluetooth device you’re playing the audio from. Radio reception on this speaker is nothing short of splendid. It’s clear with no static hiss or noise. The physical knobs are smooth and make it easy for you to tune into the station of your choice. Both AM and FM frequencies are supported and reception is good on both bands even in areas where the signal might be weak. This speaker is designed primarily as a radio hence the clear reception. The Tivoli Audio M1BTCLA’s biggest shortfall is the lack of a built in battery. This means that it has to always be plugged into a power source. As a result this speaker is not portable which means you can’t take it on outdoor trips. But then again this is not the type of speaker that you would want to use outside due to the design. It’s the type of speaker that is suited to sit in a room somewhere and be part of the décor. 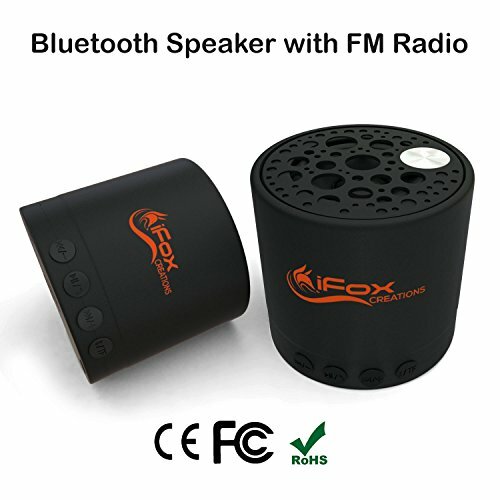 The iFox iF010 is a small but solid Bluetooth speaker. At 2.5 inches in diameter and 2.7 inches in height the iFox iF010 is a compact little guy. The black colour with the bright orange iFox logo gives the speaker a nice clean look. The black control buttons at the bottom of the speaker are well placed and go very well with the overall motif. It’s light-weight making it really easy to transport. You can pop it into a bag without feeling like you’ve added a huge weight. The added portability makes it ideal for listening to music in the bathroom early in the morning. Just pop it on top of the shelf or medicine cabinet and listen away. The amount of bass this little guy pumps out is quite impressive. For something the size of a small coffee mug the overall sound is clean. It wouldn’t be fair to expect the sound quality of something like the Monster Nomad from this speaker seeing as they are in different weight classes and target demographics. The sound is moderately loud at maximum volume. It’s particularly great for use as a hands-free speaker for phone calls and can be used in small conference calls or even in the car if your car radio doesn’t have Bluetooth. I suggest you go with good car speakers to enjoy your drive while traveling in a car. Also, to get high sound quality you can choose any of the best Bluetooth audio receivers to use with your speaker. The radio reception on this speaker is nice and clear with no static noise. The great thing about it is that the reception can be enhanced by connecting the micro-USB charging cable which does the double duty of charging the speaker as well as acting as an antenna. You won’t find any LCD display for viewing the stations. So you’ll have to rely on guesswork when tuning the radio. However, considering the price and size of the speaker this is not a real problem. The iFox can last up to 6 hours on a single charge. This is good considering the fact that it’s a small speaker hence there isn’t much room for a larger battery. Using the aux input might help you squeeze slightly more battery life out of it. The TedRo NX-401F Bluetooth speaker is a little powerhouse with quite a lot of features. The speaker is well put together and robust. It’s built to last and can stand splashes, dust and shock. Obviously, this doesn’t mean you should immerse it in water and throw it in the dust as it’s not indestructible. However, it can withstand more than the average Bluetooth speaker. It has a simple aesthetic design with four control buttons at the top of the unit. It has an SD card slot and 3.5mm aux input jack as additional audio input sources. The TedRo NX-4017f has a powerful stereo sound. It can push out a maximum of 20W and it is loud. Cranking it up to the maximum doesn’t produce any cracking, distortion or muddiness. The stereo sound it pushes out makes it stand out from most Bluetooth speakers, which are normally mono. This results in a richer, more dynamic sound since you can hear the separation of sounds unlike when listening to a mono speaker. It’s powerful enough to play music at a small pool party or at a picnic where atmospheric sounds might overpower other speakers. If you want to have more fun and enjoyment at the parties, portable speakers are the good choice. The radio receiver on this unit can handle frequencies from 87.5MHz up to 108MHz. The reception is clean with no noticeable static. 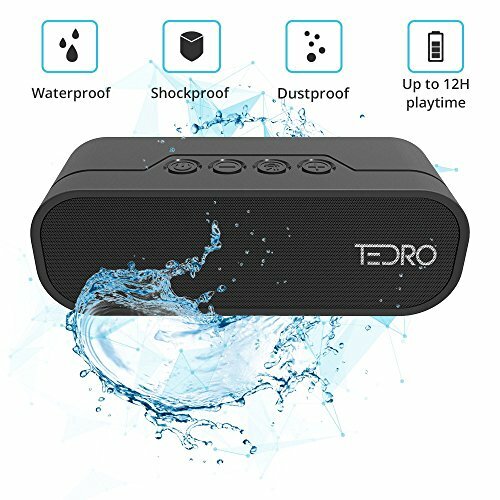 The TedRo NX-4017F Bluetooth speaker has a 4400mAh battery. This equates to a formidable duration of 12 hours on a single charge. On top of that there’s an on-board USB power bank which you can use for charging other USB devices such as your phone, tablet or MP3 player. The Anker SoundCore mini is a small factor Bluetooth speaker with great battery life and plenty of functionality. The Anker SoundCore Mini is a beautifully crafted piece of hardware. It has a very polished look and feel. It’s a really light-weight speaker that’s easy to transport. The microSD slot, power button, aux input jack and mini USB port are all tucked away neatly at the bottom of the unit. The volume and play buttons are vertically aligned on the side of the speaker. All in all, it has a stylish and modern look that can fit practically most environments and desktops. This is a low cost speaker so the sound that you get from it cannot be compared to bigger, more expensive units. With that being said the sound that this speaker produces is better than what you’d expect from something of this size. All parts of the frequency spectrum are well-represented. The bass response is adequate; nothing spectacular. The radio quality is decent. You can get static-free reception on this unit as long as the radio station you’re tuning in to is transmitting with enough power. The SoundCore 5W mini has an incredible 15-hour battery life which makes it highly portable. You can take your music collection, speaker, and go outdoors for a long time without having to worry about the speaker dying out. 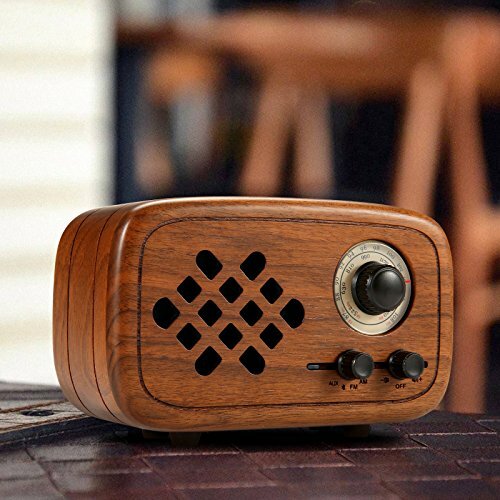 The Rerii Bluetooth speaker has unique look that ought to appeal to any lover of all things vintage. The most striking thing about this speaker is its aesthetic design. 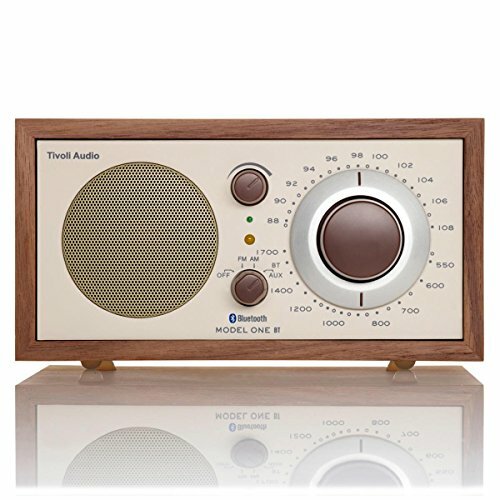 It has a retro look that’s reminiscent of early radio sets. The craftsmanship is second to none. Keeping with the retro motif there are physical knobs for controlling the speaker. The wood design should fit in very well in a room that has wooden furniture. The speaker cabinet is well-assembled and firm. The solid wood enclosure of the Rerii speaker really helps with the resonance, and the sound is nothing short of rich. It’s loud, clear and crisp. The bass is nice and tight without being too overwhelming or drowning everything else out. The rest of the frequency spectrum is also very well represented making for a well balanced speaker. Despite having good sound it’s important to take note that this speaker is not designed for people who are addicted to audio. It’s for the casual listener and people who may appreciate the classic look. The radio quality is excellent. The speaker can capture an FM signal that’s within the 87 MHz to 108 MHz range, and an AM signal within the 530Hz to 1700 kHz range. In optimum conditions the Rerii’s in-built battery can playback audio for a period of 15 hours. This makes it well suited for outdoor use. The Zipp is a speaker that’s designed primarily for indoor use. It’s feature-rich, offers 360 sound and offers multiple connection methods. The Zipp is a moderately bulky speaker weighing in at 3.3 pounds. There’s a soft fabric covering around the unit which I suppose is meant to provide some level of protection. The bottom of the unit is bare save for the 3.5mm input jack, the power button and a USB output. The main control unit, which takes the form of a multi-purpose touch-sensitive button, is at the top of the speaker. The speaker has a strap for easy transportation which is a nice touch although the size clearly indicates that this speaker was designed to be used at home. You can swap the outer sleeve by unzipping it (hence the name) and fitting another over it. If you want the best speakers for your home theater, I prefer Floorstanding speakers. 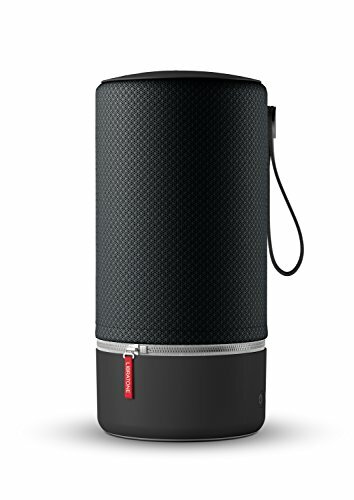 All in all the Libratone Zipp is a well-built device. The sound output is where this speaker really shines. It offers 360 degree sound so there is no such thing as a sweet spot when playing audio through it. You can place it in the middle of a room and go about your business without losing sound quality based on where you are in the room. The bass is rather strong on the Zipp so it’s well suited for people who enjoy bass-heavy music. The midrange is quite clean and sounds good. Vocals, guitar and pianos (instruments which are midrange heavy) sound full, rich and detailed on the Zipp. The highs are tame and lack harshness. In short, music sounds detailed and crisp when being played back on the Zipp. The radio reception on this is pretty good. You can use the app for listening to FM radio. There’s also room for 5 presets to get you quickly on your way. The app isn’t the easiest to navigate but once you use it for a while you should not have much trouble navigating it and tuning your stations. You can get 10 hours battery life out of the Zipp. However, if you’ve plugged in other USB devices the battery life of the speaker will drop for obvious reasons. The higher the volume the quicker the battery depletes too. It comes with an app which allows you to monitor the battery life. It’s not completely accurate but it’s really close and should help you avoid any surprises. Bluetooth speakers come in all shapes, sizes and price points. Whether you’re a very mobile, outdoorsy person, a laid-back individual, a lover of all things vintage or an audiophile you can find a speaker that suits your lifestyle. The selection of speakers in this article should point you in the right direction.